With its best-in-class heavy-duty performance and rich interior comfort, the 2019 Ford F-350 makes for a breezy day on the job. What's new for the 2019 F-350? This year, the stylish Lariat trim comes standard with a premium Bang & Olufsen stereo setup. It adds clarity and bass to your entire music collection. If you're a Lariat shopper, you can also select the new Lariat Sport package. This bundle of features includes running boards for easy cabin access. The spray-in bedliner protects the truck bed from your cargo's sharp edges. Handsome black exterior trim pieces set your Lariat apart from other F-350s. Why choose this heavy-duty truck? The F-350 is the right choice for drivers looking to tow and haul best-in-class loads, whether you're moving bricks or your family's king-size camper. This heavy-duty truck offers both gasoline and diesel power, so you can tailor your ride to suit your personal towing and hauling requirements. Besides being an extremely capable workhorse, the six F-350 trims offer varying levels of luxury, so you can create an on-road experience that's as modern and stylish as you are. How much can the Ford F-350 pull? Towing and hauling capabilities vary, depending on body style and powertrain. However, if you're looking for a heavy-duty truck that can haul a massive toy hauler or unwieldy farming machinery, the F-350 is more than capable. To maximize capabilities, choose a dual-rear-wheel configuration and the diesel powertrain. Equipped for conventional towing, this heavy-duty truck can tow up to 21,000 pounds. When you add fifth-wheel towing gear, the tow rating increases to 27,500 pounds. 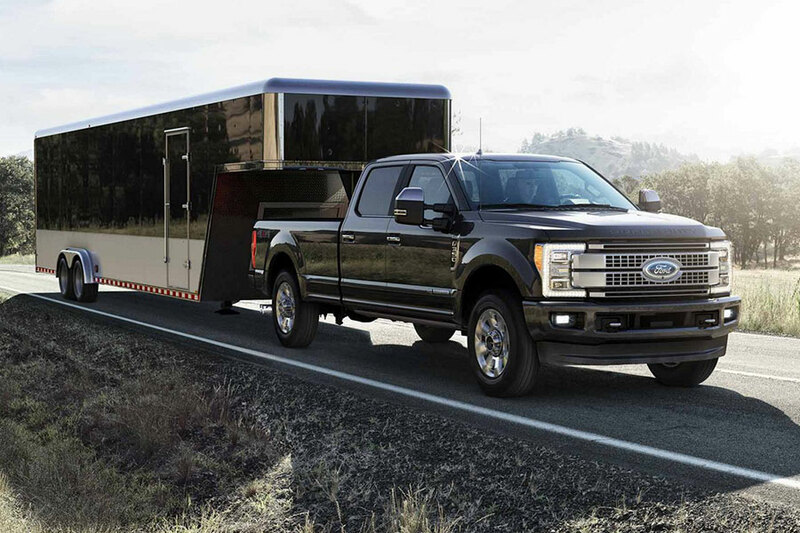 Properly equipped, this Ford truck can tow up to 34,000 pounds of gooseneck trailer. The heavy-duty F-350 also hauls seriously heavy loads, beating out even the F-450 in terms of max payload ratings. Properly equipped, it hauls 7,630 pounds of your work supplies and equipment. What are the 2019 F-350 trim models? These heavy-duty trucks are available in six trim models, each with a longer list of comfort and convenience features. Depending on trim, this Ford truck is available with the regular, extended SuperCab, and crew cabin, the latter two of which provide backseat space for your crewmates. You can also choose between the 6.8-foot and 8.2-foot beds for the hauling space you require. The entry-level trim model is the perfect workhorse. Its manually telescoping towing mirrors increase visibility when you're moving heavy loads. The removable locking tailgate with tailgate lift assist helps you transport long cargo items with ease. Vinyl seats are easy to clean. Step up to the mid-grade XLT for modern conveniences like power windows and locks. The cloth upholstery makes life on the road a little cozier. This truck is stylish and refined, serving up leather upholstery and a wealth of tech features guaranteed to impress. Use the Lariat's two 110-volt, household-style power outlets to keep your power saws and drills up to snuff from the road. With keyless entry and ignition features - as well as remote start - this truck offers a quick getaway. Inside, you'll find rich interior comfort, like special upgraded leather upholstery. Heated and ventilated front seats offer the perfect temperature for every season. Note that this trim is only available with the crew cabin, so it may not work for every driver. The Platinum's multicontour front seats offer otherworldly comfort - they even feature massage settings for relief on a particularly difficult day. This heavy-duty truck also features handy extras like power running boards and remote tailgate release, both of which mean easy ingress and egress. Like the King Ranch, the Platinum is only available with the crew cabin. Ford's top-of-the-line truck has all the trimmings. It adds to the Platinum lineup with exclusive two-tone leather upholstery and an expansive panoramic sunroof to rival lavish luxury SUVs. The Platinum's surround-view camera system helps you ease this hefty truck into a parallel space without a scratch.